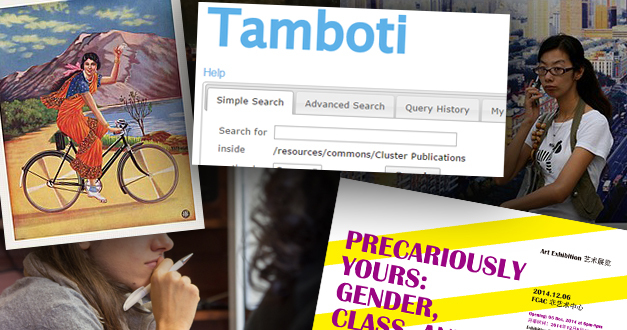 Short introduction to Tamboti, a multimedia database in ongoing development. Films, images (both photographs and scanned images from books, magazines, brochures etc. ), and texts of different kinds have been collected and stored in a multi-media database. The goal is to annotate and cross-tag the research material collaboratively. To do so the project uses Tamboti, a metadata framework to store, edit and collaboratively work on video, image and textual data within one XML database based on international metadata schemas (e.g. MODS and VRA Core 4). This is accomplished by using different annotation modules (editors) for each form of data. The created metadata is then searchable across all forms through one interface allowing films to be connected to research articles and photographs via annotations added by different members of the HERA SINGLE team who are able to work with and on the material each from their different locations in England, the Netherlands, Heidelberg, and Hong Kong.